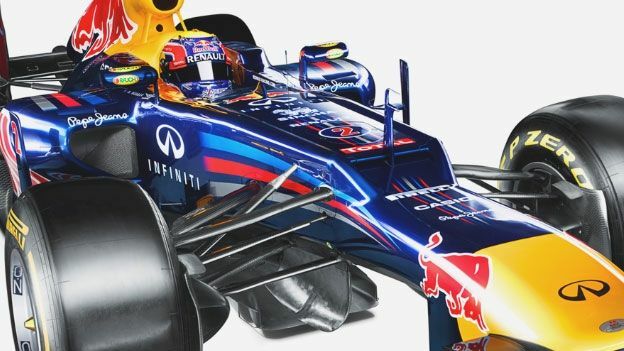 Double Formula One World Champions Red Bull Racing have unveiled the RB8, the car which the team hopes will race to victory in 2012. The Red Bull RB8 is the most eagerly awaited of the new season's contenders, and with winning team Sebastian Vettel and Mark Webber back in the driving seat, is a clear favourite for the 2012 title. Designed by Adrian Newey, the car follows the 2012 trend of incorporating the stepped-nose into the design to comply with the new lower nose-height F1 regulations. However, unlike some of the more 'ugly' competitors, the slope on the RB8's nose appears to be more graceful than many of the other cars which have been revealed so far. The Red Bull RB8 has a large nose mounted duct. It is thought to feed air from the hump on the front of the chassis forward through the nose structure and down to the front wing. It is thought that this approach increases front downforce but little is known currently known about it. Sneaking within the stringent F1 rulebook the unusual layout is legal as it is not driver operated so does not constitute a moveable aerodynamic device. The RB8 also incorporates a different exhaust to accommodate this season's rule changes. Adrian Newey's unusual, championship-winning approach to F1 design is to draw the car on paper first. “Once I've done my paper drawings, they then have to be scanned, and then there's a team of two or three people that have to take those drawings and turn them into solid surface models” he told Racecar Engineering in September last year. What do you make of the new breed of stepped-nose Formula 1 cars, ugly or innovative? Let us know via the T3 Twitter and Facebook feeds. For all the latest F1 news visit Racecar Engineering.